Grinding Techniques manufactures Superflex, Andor and Tyrolit bonded abrasives and converts Deerfos and Starcke coated abrasives at its Chamdor factory in Krugersdorp, South Africa. All its products are produced in accordance with international standards, including ISO9001, EN12413 and OSA (Organisation for the Safety of Abrasives). Grinding Techniques is a proud member of the Tyrolit – Swarovski Group. 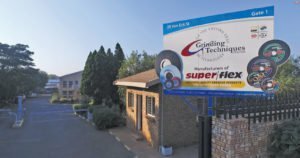 Founded in 1981 to supply specialised grinding wheels and other abrasive products to the industrial market, the company has grown to become a major force in industrial abrasive supply in South Africa, as well as the retail market due to the high demand for quality abrasive products. In addition, its locally manufactured products are exported to satisfied customers world-wide. By offering realistic make quantities, competitive manufacturing lead times, technical expertise and competitive pricing, the company is able to offer a complete package geared towards customer service and satisfaction. It is perfectly positioned to service and supply the abrasives market. The manufacturing facility is located in Chamdor, Krugersdorp and is around 11 000m2 in size (under roof). State-of-the-art equipment and machinery is used to manufacture products of the highest quality and to the highest international safety standard. The primary brand and products stocked in the retail environment is Superflex cutting and angle grinding wheels, chop saw cut-off wheels, diamond blades, coated abrasives (sandpaper sheets, rolls, belts etc) and Andor bench grinding wheels. Hardware retailers can stock Grinding Techniques products safe in the knowledge that they are being supplied by a locally based manufacturer, which offers shorter lead times, better accessibility, and backup support. The products are well represented country wide, by professional and knowledgeable sales representatives that provide technical support. The company also conducts its own research and development (R&D) and constantly monitors products to look for ways of improving performance. Locally based quality control ensures better quality products reach the shelves. This also means that should a problem arise, it can be investigated and resolved (rather than the normal practice of just ‘replace and forget’). 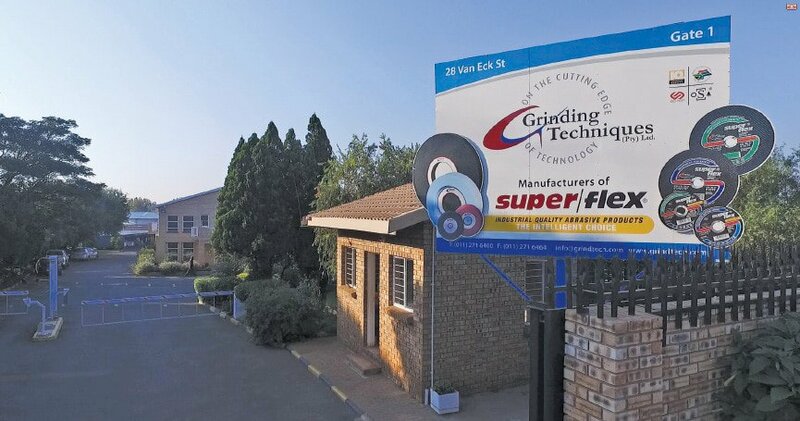 In addition to the head office and manufacturing facility in Chamdor, Krugersdorp; Grinding Techniques has branches in Cape Town, Port Elizabeth, Pinetown and Pretoria, as well as other selected distribution channels to the market. Grinding Techniques service the whole of South Africa, as well as Sub-Saharan Africa. It has its own fleet of vehicles for delivering products and also makes use of couriers for outlying areas.